The Lower Modernisms – 016. 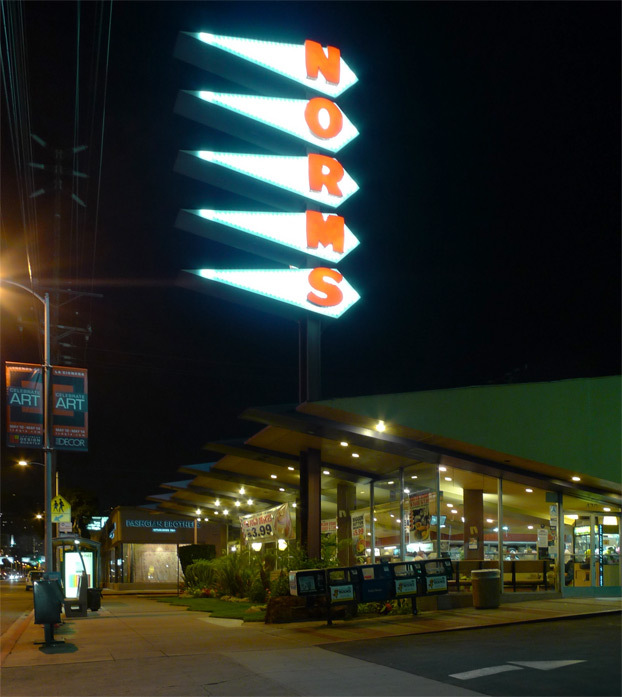 Lomo Featured Project: Norm’s Restaurant on La Cienega Boulevard. 2011 Googie Coffee Shops Bicycle Ride Series, April Ride. May 15, 2011 by James Black. Please pardon the last month’s unintended weblog hiatus. Carmen and I have been busy with the scramble of moving house, to another unit in the cozy Village Green, itself an interesting place but not quite Low enough nor quite Modern enough to be a suitable subject for the Lower Modernisms. 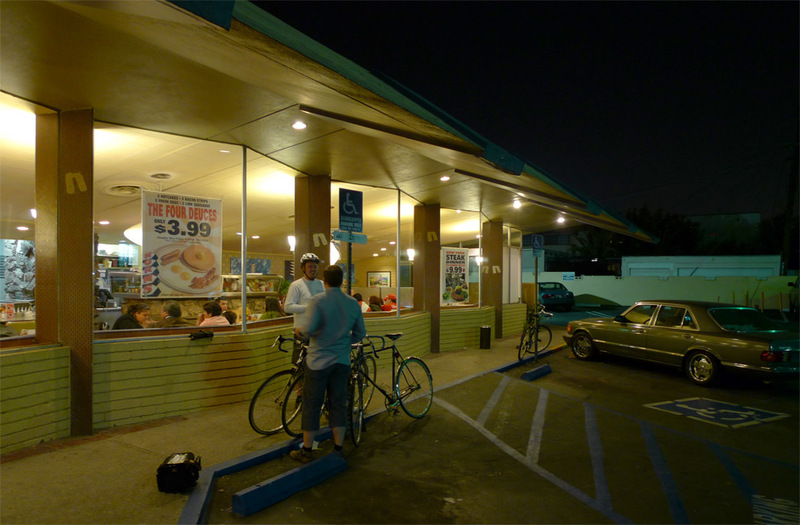 Before the LoMos project can get back down to the gritty and unsavory hind-quarters of the Modern, from the heights of Nearly Legitimate Architecture I report today on the fourth installment of the Googie Coffee Shops Bicycle Ride Series, which on April 14th took us on an evening visit to the Norm’s Restaurant at 470 North La Cienega Boulevard in the city of Beverly Hills. Artist Ed Ruscha made this particular coffee shop extra-famous by depicting it in flames, working within the hallowed artistic tradition of gleefully depicting the destruction of Los Angeles that goes back at least as far as Nathanael West’s The Day of the Locust. The animated electrographic sign, in a style termed the “Sawtooth Pennant” by the Norm’s website, is a signature Norm’s element and here its shape relates directly to the off-center, diamond-shaped mass that forms the roof, presumably built from wooden trusses. That’s precisely the attitude that you want to hear from your Lower Modernist architect – Davis sounded self-deprecating about his own work, but his comment also recognizes that their job was to sell hamburgers, so that’s what Armét and Davis did to the best of their abilities and their available means, quietly being kickass in Greatest Generation style. 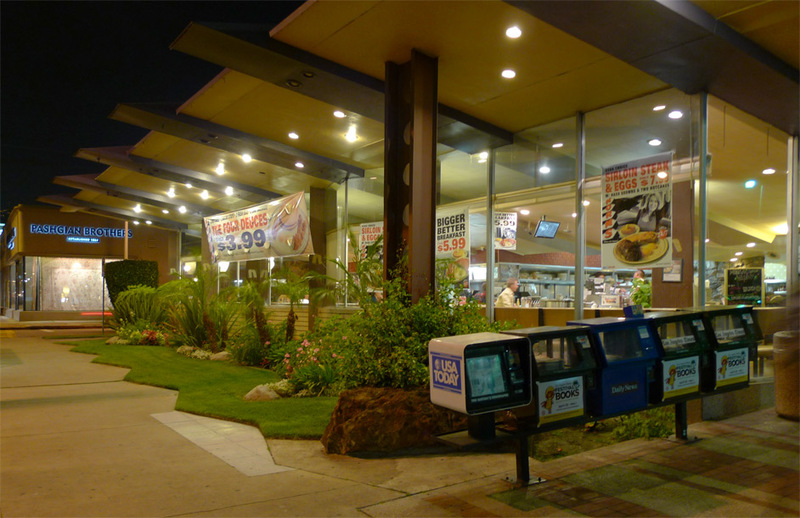 This location is still selling burgers 24 hours a day, and the exterior at least is reasonably well preserved. The interior layout along La Cienega follows the familiar Armét and Davis pattern with banquettes along the street wall opposite a counter with stools facing an open kitchen, and a ceiling line that angles up toward the street to create a sense of both openness and shelter. 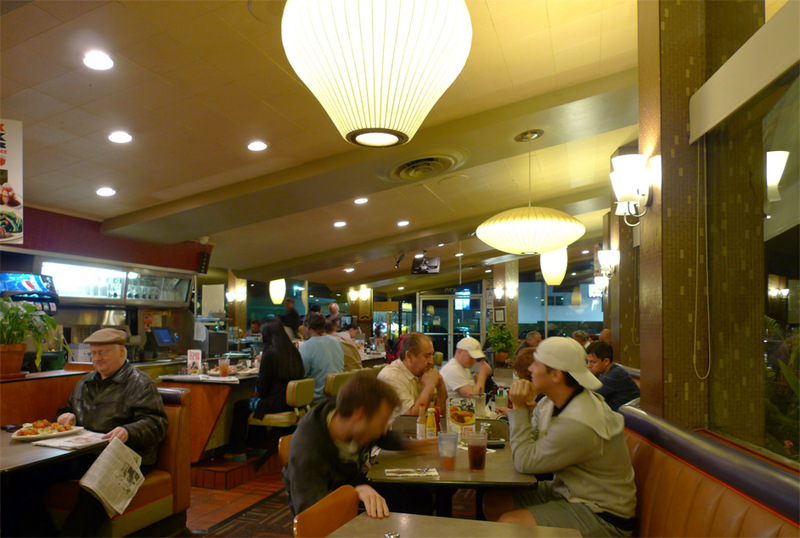 At Norm’s, in contrast to other Armét and Davis shops, the banquettes and tables follow the zigzag motif used in the exterior wall. The sloped ceiling, clad in adhered acoustical tiles, is interrupted at intervals by dropped beam-like decorative elements that extend past the glazed wall to form the ribs seen on the roof and soffit at the exterior. These dropped elements, painted in contrasting color, are boxed out as a “hard lid” and contain both the ventilating air supply registers and the suspended ceiling light fixtures. As Kyle Pfister commented, at Norm’s the mechanical and structural systems have been integrated with the “decorative system”. The original custom trapezoidal pendant lights have been replaced by these contemporary George Nelson-designed Bubble Lamps. 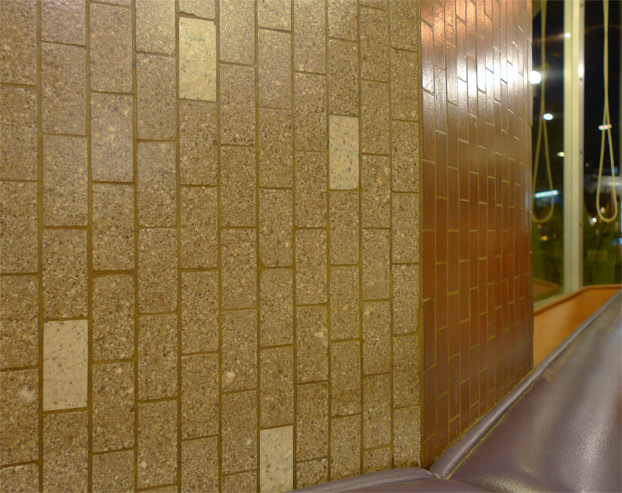 The interior finishes have suffered a bit over the years, with the terrazzo long eclipsed by Spanishizing red tiles. The diamond-shaped columns relate to the zig-zag elements and the skewed-diamond of the roof truss. The two adjoining faces of the column are clad in different ceramic tiles, a solid color on one side and a jaunty composition of speckled tiles on the other. 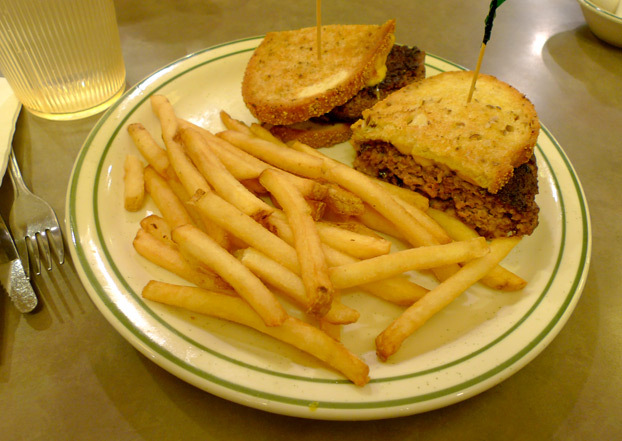 I was compelled to order a patty melt when I read on the menu the claim that the namesake founder of Norm’s, Norm Roybark, invented the patty melt personally. 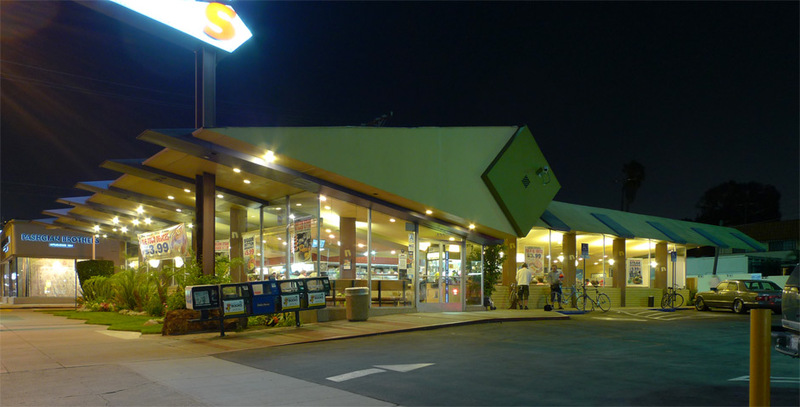 A quick review of internet hearsay turns up the competing and more popular claim that the patty melt was invented by competing Googie restaurateur William “Tiny” Naylor (who owned a chain of Googie coffee shops named Tiny Naylor’s, including a location that, like Norm’s, was also designed by Armét and Davis in 1957 on La Cienega Boulevard). Either way, patty melts are the Googie of food.